While Blizzard may make its flagship MMO free-to-play someday, World of Warcraft's current subscription model is bringing smiles to faces and dollars into bank accounts. Why pay a monthly fee for a game when you can play a different game for free? Blizzard's star MMO, World of Warcraft, faces this question right now. The market is nearly glutted with free-to-play MMOs, from Lord of the Rings Online to Star Trek Online, and from Aion to DC Universe Online. While there's plenty of room to argue the comparative value of subscription vs. free-to-play (which, to be fair, usually end up costing money after a certain point anyway), Blizzard knows where it stands. World of Warcraft may not maintain its subscription fee forever, but right now, Blizzard thinks it's the best choice for both company profit and player satisfaction. "We're very happy with the sub model - it works very well for us for various reasons," says John Lagrave, a game producer for WoW. "[We] think we offer great value in all the content we have for the player." Lagrave believes that a free-to-play model can "burn out players," especially given the ferocity with which players often pursue MMO leveling. Even so, Lagrave admits that free-to-play could be lucrative. "[Do] you make a ton more money? Maybe ... I'm not saying we're never going to go to free to play, we do that with the trial right now, but we're ... doing very well." 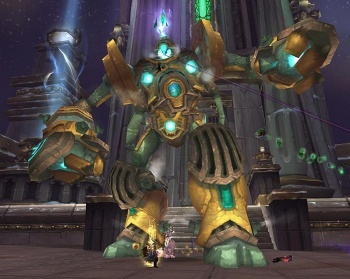 There's no question that WoW is drawing in bucketloads of money, just as Lagrave suggests. However, between Star Wars: The Old Republic taking a bite out of its subscriber base and having to lay off 600 employees, the subscription mode is not working for Blizzard now as well as it has in the past. Now that Blizzard has shown its willingness to consider free-to-play in a larger context, will the subscription model slowly give way to a new paradigm? Furthermore, if WoW decides to eschew a subscription model, is there any other MMO that feels it could profit with one?